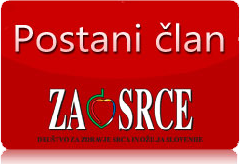 The Slovenian Heart Foundation (originally Društvo za zdravje srca in ožilja Slovenije) is a humanitarian non-governmental organisation that has been operating in the public interest in the field of health care since 1991. The Foundation carries out its activities throughout Slovenia. It includes 9 branches and two independent associations (the Regional Heart Foundation for Maribor and the Podravje Region as well as the Regional Heart Foundation for the Pomurje Region) with over 8,000 members altogether. 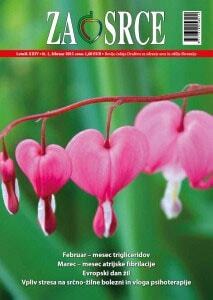 The mission of the Foundation is the prevention of cardiovascular diseases. This includes raising awareness among our members as well as the Slovenian population about a healthy lifestyle, and the prevention of risk factors for cardiovascular diseases. The Foundation takes measures in the field of protective food consumption, smoking prevention, physical activity promotion, as well as health checks based on blood pressure, cholesterol, and blood sugar measurements. In more than 20 years of its existence, the Foundation has contributed greatly to raising awareness on reducing risk factors leading to cardiovascular diseases. The mission has been extended even further by establishing the Bimbam Heart Foundation (‘Ustanova Srček Bimbam’) which offers help to children in Slovenia being treated outside of their permanent residence area. The vision of the Foundation is to contribute to the reduction of the mortality rate due to cardiovascular diseases as well as all chronic noncommunicable diseases for 25 % by 2025. To achieve this objective, the Foundation established the Network of Non-Governmental Health-Care Organisations 25×25 (in short: the NGO Network 25×25) in 2012. Membership: The Foundation is a member of the European Heart Network (EHN), the World Heart Federation (WHF), and the European Congenital Heart Disease Organisation (ECHDO).